Not everyone limits their holiday shopping to just the day after Thanksgiving, especially card collectors. Acknowledging the popular online shopping holiday, 2016 Panini Cyber Monday takes its cue from the annual Black Friday set but is geared to the many card case breakers. Made available only to the online breakers, 2016 Panini Cyber Monday is a fairly simple promo set with a multi-sport checklist. The base set includes just 49 cards with 20 being top rookies of the various sports featured in the release. This includes notable players from the worlds of basketball, baseball, football and racing, with either professional or college licensing and images. 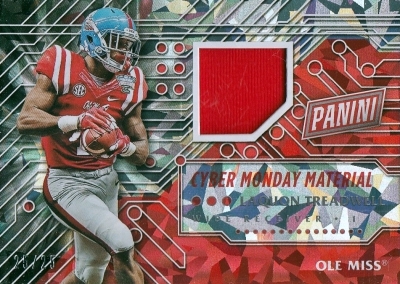 While many of these promotional sets stick to very plain designs, Panini Cyber Monday has a distinct look reminiscent of a computer grid with a diagonal background fill. Dubbed Cyber Monday Material, the rookie-focused relic insert incorporates the same primary design from the base set. However, the orientation switches from vertical to horizontal and a small memorabilia piece is added to the card. Collectors can also find serial numbered parallels limited to 25, ten and one-of-one. Similar to the Black Friday set, the two-card packs are distributed based on select box purchases made by breakers. The cards are specifically created for this promotion and exclusive to the set. 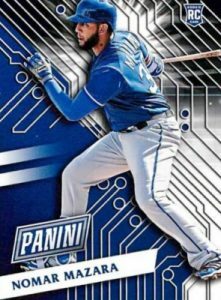 Nomar Mazara 2016 Panini Cyber Monday Rookie Jersey Relic RC! NICE RANGERS RC! Trevor Story 2016 Panini Cyber Monday Rookie Jersey Relic! NICE ROCKIES RC! Miguel Sano 2016 Panini Cyber Monday Rookie Jersey Relic RC! NICE TWINS RC! PARALLEL CARDS: Cracked Ice #/25, Galactic Window #/10, HyperPlaid 1/1.